When you are ready to head out in comfort to see the countryside, take this Montana with you. 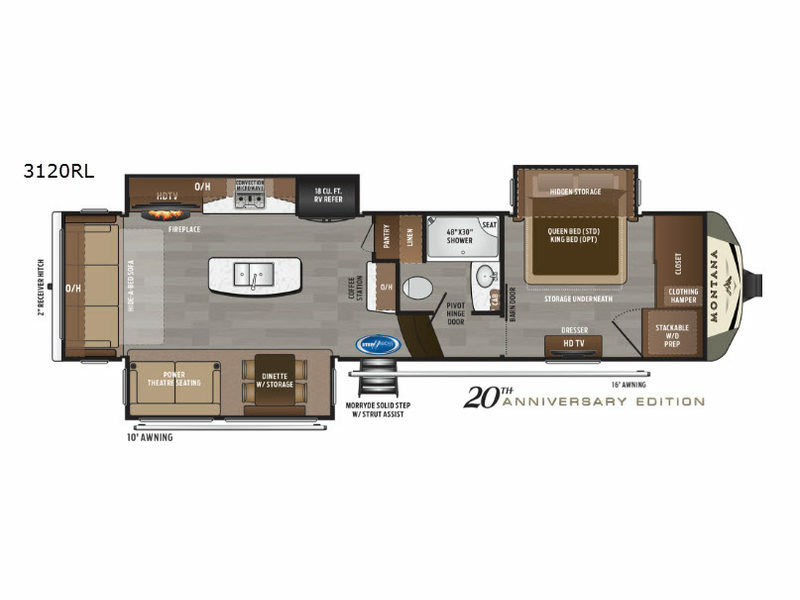 This fifth wheel offers a rear living and kitchen area with dual opposing slide outs for more interior floor space, plus seating for the whole gang including theater seats with power recliners. You are sure to enjoy the HDTV and fireplace on those inside camping days. The kitchen offers the chef a center island for preparing food, an 18 cu. ft. RV refrigerator, a convection microwave, a coffee station for the coffee lover in the family, and a pantry for your dry goods, plus more. You will also find plenty of storage throughout for all your things. Outside there are two awnings providing an outdoor living space, and you will find additional storage. Take a look, you will be pleased you did.